This one is for all of my bakers out there. 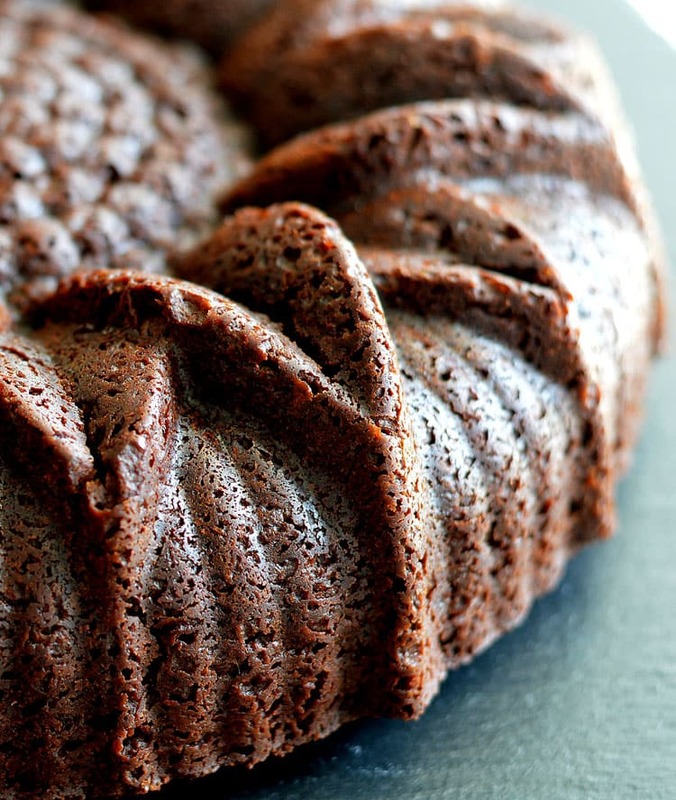 Vegan Chocolate Pumpkin Bundt Cake. Doesn’t that sound absolutely amazing? I love anything pumpkin. Literally anything. But combine it with my other favorite food group chocolate (chocolate is a food group, right? ), and I just cannot resist! This bundt cake boasts an entire 15 oz. can of pure pumpkin puree, two full teaspoons of pumpkin pie spice (next time I might add even more) and 3/4 C of cocoa powder. While the recipe does have more ingredients than others I have done in the past, I promise you this one is worth it. Plus, most (if not all) of those ingredients are what you already have on hand in your pantry. The only thing I had to shop for was cake flour, which is much lighter than all purpose. This cake begins like most others. If you regularly bake, this process will be nothing new to you and if you don’t bake, it’s incredibly simple. Dry ingredients are sifted into one bowl while the pumpkin puree, brown sugar and homemade buttermilk are placed into the bowl of an electric mix. That buttermilk is actually 1 C of almond milk + 2 Tbl of vinegar. I used apple cider vinegar, but white works too. This creates a chemical reaction that is similar to actual buttermilk and works perfectly as a vegan substitute. I used a few other substitutions in this recipe. Instead of eggs, there is 1/4 C of applesauce and 2 Tbl of vegan sour cream (you could also use canned coconut milk). I like my cakes fairly simple. A shake of powdered sugar, perhaps a drizzle of chocolate sauce or even some vanilla almond milk ice cream. Since I always like to share with you my thoughts on a recipe, I must say in complete honesty…I have never liked Bundt cake pans. Obviously, the cake has to take on and retain that shape & my personal feeling is that because of this, some areas are much less tender than others. If you like that, cool! You are probably the same person who likes the edges of brownies 🙂 This somewhat dense cake is very much the same texture, actually. I…am a center piece person who only occasionally likes edges. The flavor was on point for me, so in light of that, I am going to try this out in a standard cake pan and I will report back to you with an update! You might also enjoy my CHOCOLATE CAKE with BUTTERCREAM FROSTING, CHOCOLATE TOFU POUND CAKE, VEGAN HOT FUDGE PUDDING CAKE or VEGAN BLACK FOREST CAKE. 2 tsp Pumpkin Pie Spice see blog post to learn how to make your own! 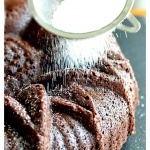 Preheat oven to 400 degrees and prepare a bundt or cake pan with cooking spray. In the bowl of an electric mixer, combine the milk/vinegar mixture, pumpkin and brown sugar. Beat until the sugar dissolves. To that same bowl, add the applesauce and sour cream. Beat until combined. Lastly, to that same bowl, add the oil, corn (or brown rice) syrup and vanilla extract. Beat until combined. Slowly incorporate the dry sifted mixture into the wet mixture just until combined. Finish with a spatula, but do not over mix. Evenly distribute the batter into the desired pan(s). 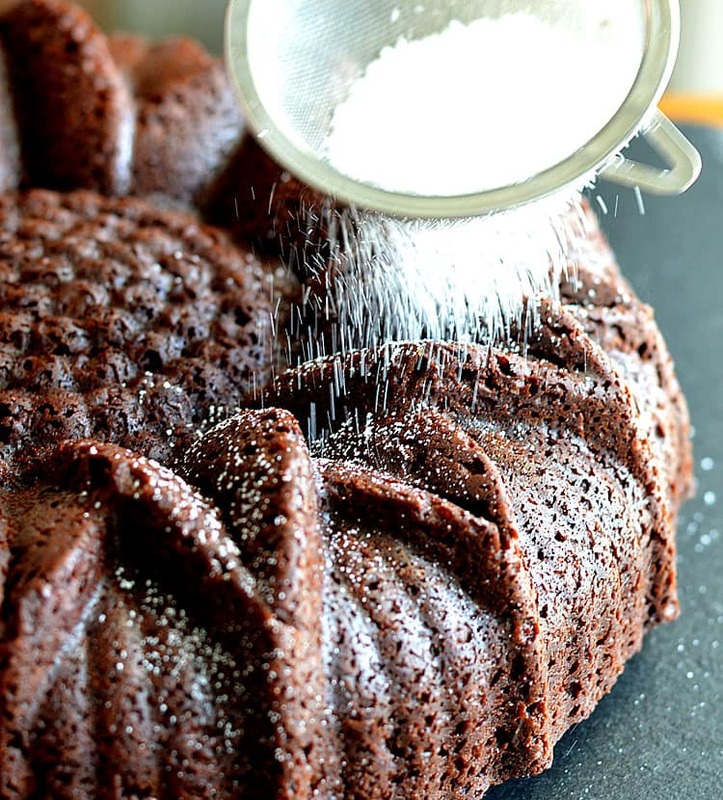 Baking can take an hour (or more) if using a bundt pan. The time would be much shorter using traditional cake pans. Use a toothpick and when inserted, it should have crumbs or come clean. This is a dense cake and does take longer to bake. Allow to cool in the pan for 15 minutes and then remove to a rack to cool completely. Serve with a scoop of vanilla almond milk ice cream and a dusting of powdered sugar. 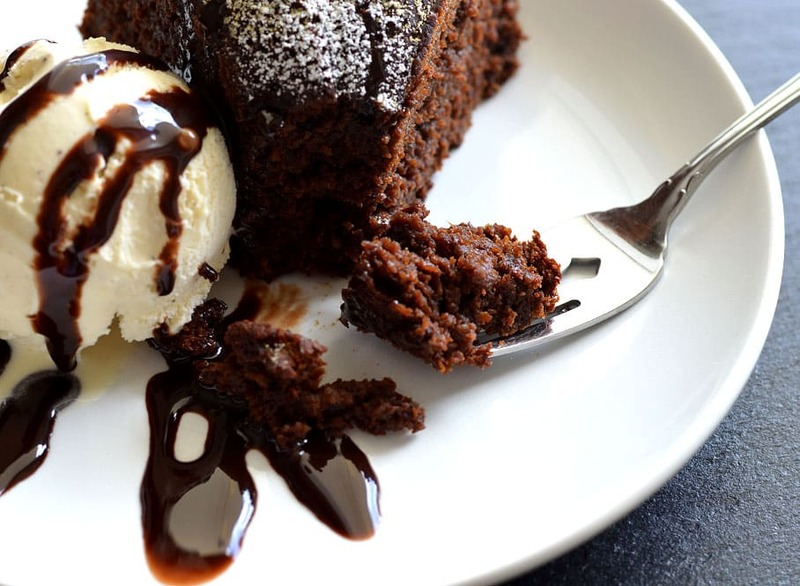 If desired, drizzle with chocolate syrup. Regarding the sugar: I don’t typically have white sugar, but I do have organic cane sugar and brown sugar, am I able to substitute these for the white sugar? Very good taste. I liked the lighter spice taste. I halved the recipe and baked for 35 minutes. Came out great. Thanks for sharing your recipe.